Henry Steel Olcott (1832-1907) lived the first half of his life the way a respectable gentleman was expected to live in 19th century America. He served as a Union officer in the U.S. Civil War and then built a successful law practice. And in the second half of his life he traveled to Asia to promote and revive Buddhism. Henry Steel Olcott's unlikely life is better remembered in Sri Lanka than in his native America. Sinhalese Buddhists light candles in his memory every year on the anniversary of his death. Monks offer flowers to his golden statue in Colombo. His image has appeared on Sri Lanka postage stamps. Students of Sri Lanka's Buddhist colleges compete in the annual Henry Steel Olcott Memorial Cricket Tournament. Exactly how an insurance lawyer from New Jersey became the celebrated White Buddhist of Ceylon is, as you might imagine, quite a tale. Henry Olcott was born in Orange, New Jersey, in 1832, to a family descended from the Puritans. Henry's father was a businessman, and the Olcotts were devout Presbyterians. After attending the College of the City of New York Henry Olcott entered Columbia University. The failure of his father's business caused him to withdraw from Columbia without graduating. He went to live with relatives in Ohio and developed an interest in farming. He returned to New York and studied agriculture, founded an agricultural school, and wrote a well-received book on growing types of Chinese and African sugar cane. In 1858 he became the agriculture correspondent for the New York Tribune. In 1860 he married the daughter of the rector of Trinity Episcopal Church in New Rochelle, New York. At the beginning of the Civil War he enlisted in the Signal Corps. After some battlefield experience, he was appointed a Special Commissioner for the War Department, investigating corruption in recruitment (mustering) offices. He was promoted to the rank of Colonel and assigned to the Department of the Navy, where his reputation for honesty and industriousness earned him an appointment to the special commission that investigated President Abraham Lincoln's assassination. He left the military in 1865 and returned to New York to study law. He was admitted to the bar in 1868 and enjoyed a successful practice specializing in insurance, revenue, and customs law. To that point in his life, Henry Steel Olcott was the very model of what a proper Victorian-era American gentleman was supposed to be. But that was about to change. Since his Ohio days, Henry Olcott had harbored one unconventional interest -- the paranormal. He was especially fascinated by spiritualism, or the belief that the living can communicate with the dead. In the years after the Civil War, spiritualism, mediums and seances became a widespread passion, possibly because so many people had lost so many loved ones in the war. Around the country, but especially in New England, people formed spiritualist societies to explore the world beyond together. Olcott was drawn into the spiritualist movement, possibly to the consternation of his wife, who sought a divorce. The divorce was granted in 1874. That same year he traveled to Vermont to visit some well-known mediums, and there he met a charismatic free spirit named Helena Petrovna Blavatsky. There was little that was conventional about Olcott's life after that. Madame Blavatsy (1831-1891) had already lived a life of adventure. A Russian national, she married as a teenager and then ran away from her husband. For the next 24 or so years, she moved from one place to another, living for a time in Egypt, India, China, and elsewhere. She claimed also to have lived in Tibet for three years, and she may have received teachings in a tantric tradition. Some historians doubt a European woman visited Tibet before the 20th century, however. Olcott and Blavatsky blended together a mix of Orientalism, Transcendentalism, spiritualism, and Vedanta -- plus a bit of flim-flam on Blavatsky's part -- and called it Theosophy. The pair founded the Theosophical Society in 1875 and began publishing a journal, Isis Unveiled, while Olcott continued his law practice to pay the bills. In 1879 they moved the Society's headquarters to Adyar, India. Olcott had learned something about Buddhism from Blavatsky, and he was eager to learn more. In particular, he wanted to know the Buddha's pure and original teachings. Scholars today point out that Olcott's ideas about "pure" and "original" Buddhism largely reflected his 19th-century western liberal-transcendentalist romanticism about universal brotherhood and "manly self-reliance," but his idealism burned brightly. The following year Olcott and Blavatsky traveled to Sri Lanka, then called Ceylon. The Sinhalese embraced the pair with enthusiasm. They especially were thrilled when the two white foreigners knelt to a large statue of the Buddha and publicly received the Precepts. Since the 16th century Sri Lanka had been occupied by Portuguese, then by Dutch, then by British. By 1880 the Sinhalese had been under British colonial rule for many years, and the British had been aggressively pushing a "Christian" education system for Sinhalese children while undermining Buddhist institutions. The appearance of white westerners calling themselves Buddhists helped to begin a Buddhist resurgence that in decades to come would turn into a full-blown rebellion against colonial rule and the forced imposition of Christianity. Plus it grew into a Buddhist-Sinhalese nationalism movement that impacts the nation today. But that is getting ahead of Henry Olcott's story, so let's go back to the 1880s. As he traveled Sri Lanka, Henry Olcott was dismayed at the state of Sinhalese Buddhism, which seemed superstitious and backward compared to his liberal-transcendentalist romantic vision of Buddhism. So, ever the organizer, he threw himself into re-organizing Buddhism in Sri Lanka. The Theosophical Society built several Buddhist schools, some of which are prestigious colleges today. Olcott wrote a Buddhist Catechism for that is still in use. He traveled the country distributing pro-Buddhist, anti-Christian tracts. He agitated for Buddhist civil rights. The Sinhalese loved him and called him the White Buddhist. By the mid-1880s Olcott and Blavatsky were drifting apart. Blavatsky could charm a drawing-room of spiritualist believers with her claims of mysterious messages from invisible mahatmas. She was not so interested in building Buddhist schools in Sri Lanka. In 1885 she left India for Europe, where she spent the rest of her days writing spiritualist books. 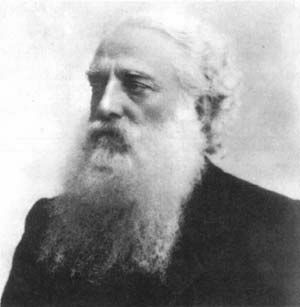 Although he made some return visits to the U.S., Olcott considered India and Sri Lanka his homes for the rest of his life. He died in India in 1907.